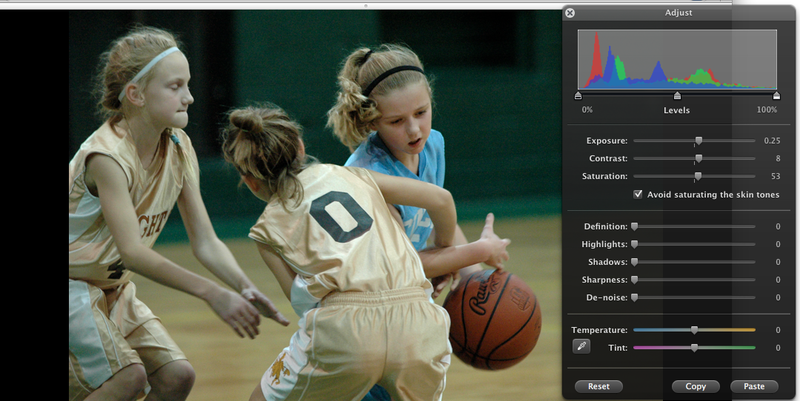 Do you have a high end digital SLR but still get blurry action shots when shooting pictures inside a gym? I feel your pain. I was so frustrated when I would get a good action shot beautifully timed and framed only to get home and see that feet, hands and the ball were blurry. Despite buying a high end digital SLR D70 Nikon with a Nikon Nikkor 70-300 zoom lens, we struggle to get good action shots inside. The shot to the right shows my daughter walking (not running) up the court. The gym in which this shot was taken is one of the better lit gyms, yet most of the pictures are blurry. Prior to Christmas, I received lots promotional mailers for cameras that piqued my interest because of my frustration concerning blurry basketball pictures. 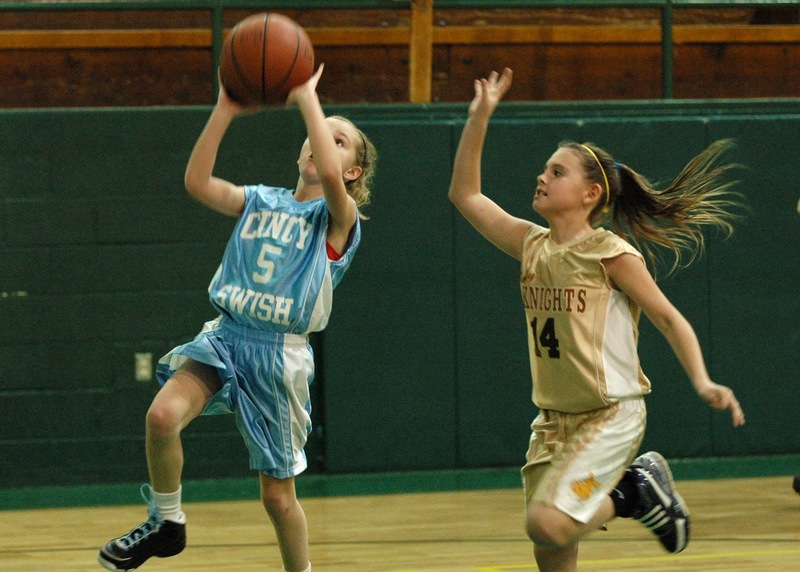 Basketball seems to be my daughter's favorite sport, so I thought that I would invest money in a newer camera to capture the action. I decided to go to a photography store instead of a Big Box store like Best Buy. I wanted to make sure that I got advice from an expert before I purchased another expensive camera. I was considering a Nikon D7000 for $1,500. I figured that the D7000 camera would be able to capture indoor images better than my 5 year old D70. The D7000 has a 16.2 MP (million pixels) sensor compared to the 6.1 MP sensor of the D70. It also has a higher ISO range. The ISO deals with light sensitivity. To my surprise, the expert at the store told me that my camera is not the problem, the lens I am using is. He said that he would gladly sell me the D7000 and it would produce slightly better pictures in lower light situations due to the higher dynamic range of the ISO which goes up to 6400 (the D70 max is 1600) but it would still produce blurry stop action shots in lower light situations with a standard lens. He recommended that I keep the D70 and buy a better lens with a larger aperture. The Nikon Nikkor 70-300mm zoom lens has a f/4 and f/5.6 aperature size. (F/4 when the lens is 70mm and F/5.6 when the zoom is set to 300mm). The larger the number, the less light entering into the lens. I needed a faster lens. I ended up buying the Tamron SP AF70-200mm lens with an F/2.8 (aperture) for $800. Nikon has a similar and perhaps better lens for $1200, but I was told that an amateur photographer like me would not likely notice any difference. I saved the $400 and bought the Tamron. I am not an expert on photography but I followed the advice below on how best to capture stop action photos in low light situations and it worked for me. 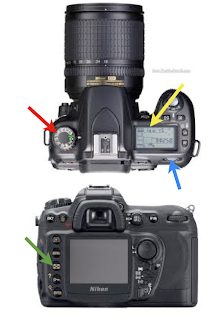 Set your camera to the S setting using the dial indicated with the red arrow. The S mode is an auto-exposure method in which the lens aperture is automatically set by the camera and you manually select the shutter speed. Set the shutter speed. Use the dial indicated by the blue arrow. Look at the shutter speed which can be set between 30 seconds to 1/8000 of a second on my camera. The shutter speed is indicated by the yellow arrow. Rotate the dial until you get to 250. To the right of the number you may see a warning of Lo (low light) or Hi (too much light) for the corresponding shutter speed and the aperture of the lens. Set your ISO to the maximum (1600 on the D70). Two ways to do this. A.) When the monitor is off, press the button on the back of the camera that looks like a checkers board - ISO is printed above it. (Green arrow) While holding this button rotate the dial indicated with the blue arrow. or B.) Using the monitor, press menu, highlight the camera icon on the monitor, scroll down to the ISO and select 1600. On your computer, you can add light to any image. This is very easy to do especially on iPhoto. Slide the exposure to the right until you get the right amount of light. My wife took the following pictures using the new lens and the advice above. 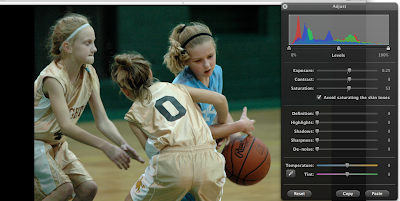 If you are a youth sports nut like me and your kids play inside sports like basketball, volleyball, wrestling or futsal then invest in a good zoom lens with an aperture of 2.8 or lower. You will not regret it. I wholeheartedly agree, being a photography enthusiast myself. It's a big bonus that you and your wife are both sports fanatics and have a great working knowledge of the sports your children are playing. Familiarity with the game is the most important piece of gear in your camera bag. It's one piece of gear with lifetime free upgrades. That is a good point - Elliot. 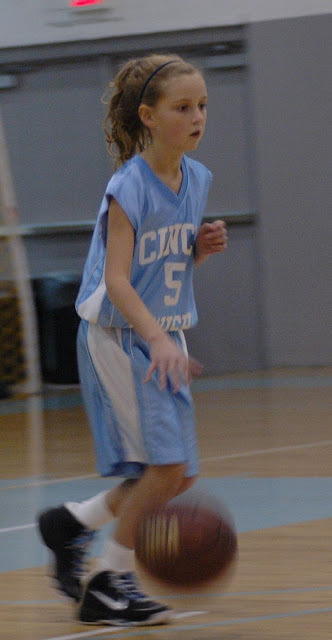 Reducing blur would often require good panning shots. I had practice with NASCAR races and local basketball games. Still, the shot steady is the main factor. This is indeed one of the most common problems when taking moving objects and subjects. It's good to know that there are already new technologies that support image stabilization. The blurry effects can now be reduced. I have simple digital camera and it takes good photos without any blur. THANK YOU!! I have been shooting my son's soccer games for years and have captured many amazing action shots outside. Last weekend I tried basketball for the first time and was completely baffled and dismayed. Your steps have helped tremendously and spoke to exactly what I needed. Good stuff here. Thank you. I have been an enthusiast photographer for 30 years and love the challenge of shooting my children (5 of them) in their games/matches/meets. Nothing better! What are your experiences with sports photography companies selling action photos at tournaments? I have found most to be really average. I'd more than willingly pay well for photos (so I could just sit and watch!) if they were of exceptional quality (ESPN-like) but most that I have seen I can do much better myself. I think most are studio photographers that are clueless about the sports that they are shooting. I have seen one company that is really good and they do some really quality work, had a nice viewing tent with multiple computers to view the photos, and had a good model. Very professional and very good, but in my experience, they are the exception. What are your thoughts? 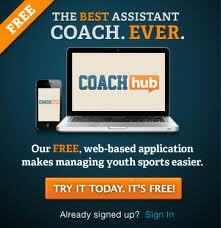 On pricing and quality and is it something you think is really lacking in our sports? Would it be something that could flourish if built right (like the one example above)? Thanks! I hear you when you say that you would rather sit and watch. My wife takes most of the pictures because I am usually keeping score. I do not buy much from the sports photography companies although some do a good job. Disney Wide World of Sports did a nice job. Still I like my images better and they are a lot cheaper. The problem with the sports photography companies is that they are not as interested in my kid as I am. It takes 1,000s of shots to get the exact right moment. I have 30,000 pictures and probably deleted 2 for every image I keep and still there are maybe 10 to 20 shots that jump out at you. I am sure you know what I am talking about - hard to describe it - but it is a shot that captures the exact moment and the raw emotion of a play. The ESPN-like shot. Those are not easy to get. Although it is getting much easier with my new camera that shoots 6 frames per second. Oh yeah, this is really frustrating. I'm far from being a professional photographer but I have a decent camera so I thought I would just be fine capturing my son in action while playing basketball. Imagine my disappointment when I saw tons of blurry pictures. I'm gonna try this out and see if it will work for me too. Great buy the lens on Amazon link on the page - you will not regret it. Question.. did you buy the SP or the AF? I can't find SP for less than $1200 but the AF does seem to retail around $800. Just curious if you got a really good deal of if it's the other lens. I am not sure. I can tell you that I did not really shop around for a great deal, so I would assume the AF. I can tell you that if I have the AF it works pretty well in indoor settings. The one that I bought is featured in the Amazon link above. Thanks so much for writing this article. I recently upgraded my olympus e410 to Sony a58 and also purchased the Tamron 70-200. My son's football and lacrosse pictures are perfect but the basketball pictures are partially blurry just like yours! I can't wait to try these setting tonight during his Varsity game. I've tried everything but most of the articles are pro's talking way above my head! Thanks again! I appreciate you effort on posting this interesting post. Using this post I learn many things about action photos. Yes, to take great picture and video we need to make this by a high resolution camera. If we don't do it buy the high resolution camera than we will not get the best quality of picture and video. You can easily make such photos without Photoshop using the app for focus and blur from https://macphun.com/focus you don't need to waste your time or have a professional camera and skills, a little practice and you'll make it even better than this. Look at teensafe cost and you can understand that it's not that high price for 24/7 constant monitoring app. Thank you for sharing. Useful tips. I do not have these lenses, I use filters https://photolemur.com when processing photos. It is an alternative, there are now a lot of various filters, I chose this. Good luck with photos.